Almost every day, ordinary Russians in the capital city get to experience what it feels like to be royalty, and so can visitors like you and me. Welcome to the Moscow Metro, also known as the People's Palace, which is one of the few grandiose and monumental Soviet architecture to be fully realised. At the direction of Joseph Stalin, engineers, architects, artists and workers were recruited to construct the stations that have grown to 252 across 14 lines, with the first beginning operations in 1935. 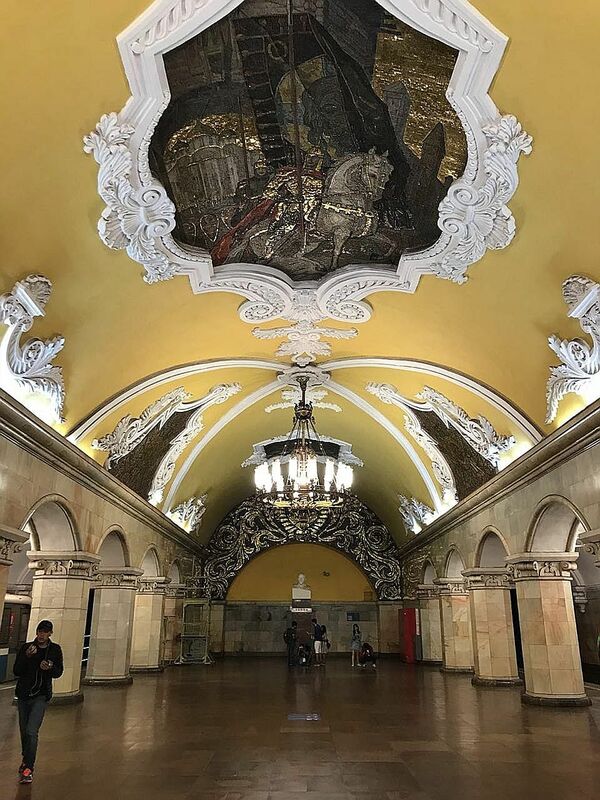 Spacious and grand, each stop is a jaw-dropping work of art, featuring marble columns, mosaics, chandeliers, bas-reliefs, frescoes and sculptures designed to demonstrate the achievements of Soviet power, and raise the confidence and prestige of the working class. Some are clearly more elaborate and opulent than others. The Ploshchad Revolyutsii station has 76 bronze figures in the niches of its 18 arches. One of them is a Red Army soldier, whose gun is stolen three to four times a year, another sculpture is a border guard with a dog, whose nose is gleaming as it is often rubbed by students who wish to ace their exams and by visitors for good luck. Komsomolskaya also has rich decoration devoted to the Soviet victory in the Great Patriotic War. Russian commanders and weapons of various eras are immortalised on mosaic panels made from smalt and precious stones, while Novoslobodskaya features 32 stained-glass windows and chessboard-patterned flooring. Elsewhere, Vorobyovy Gory was built on the two-storey metro bridge and has become a favourite meeting place for lovers , who scale the escalators to the top of the Sparrow Hills. However, most stations are built below ground - at 84m under, Park Pobedy is the fourth-deepest in the world, the 126m escalator ride alone takes three minutes - and the acoustics makes them ideal locations for fans during this period to fill the air with their songs and chants before and after matches. There are metro systems in seven Russian cities, but the Moscow Metro is by far the most extensive one here, covering 425km over and underground, and carrying almost seven million passengers every day. Despite the load, the minimum interval in train traffic is 90 seconds during its operating hours from 5.30am to 1am, although the frequency may drop to 10 minutes during off-peak periods. Free Wi-Fi is also available via registration of a functioning mobile number. Each trip, regardless of distance, costs 55 roubles (S$1.20), which can be viewed as a cheap visit to different museums at one go, and multiple-trip tickets are sold at a discounted rate - 60 trips are priced at 1,765 roubles for example. There are many interesting nuggets about the Moscow Metro that cannot be covered fully within a postcard, but here are the ones that appeal to me. The original Moscow Metro project did not plan for the circle line, in which every station is an interchange to another line. Legend has it that Stalin put his cup of coffee on the metro map, leaving a brown spot around the city centre, and that was how it got commissioned and sports the same colour on the map. The deep underground stations have served as bomb shelters - 213 people were born in this metro during World War II - and are still equipped for short-term residence with emergency autonomous systems for filtering, power and water supply, emergency exits, sealed stations and ventilation shafts. Conspiracy theories are also abound of a secret second metro system, code-named D-6. It is said to be a single track connecting the Kremlin, the Federal Security Service HQ in Lubyanka, the Ministry of Defence and other secret installations, and built for the emergency evacuation of important people in case of a nuclear attack. Last but not least, there is a good chance Singaporeans may feel hungry at some point of their Moscow Metro experience. After all, there are 112 stations with "kaya" in their names!